“Inspiration comes from nature: first from the shape itself, then from the surrounding environment. […] I work in a unique Haida stone, and my images come from our songs and stories, from our culture and our landscape.” Donnie Edenshaw (Quoted in Sheehan 2008, 40). 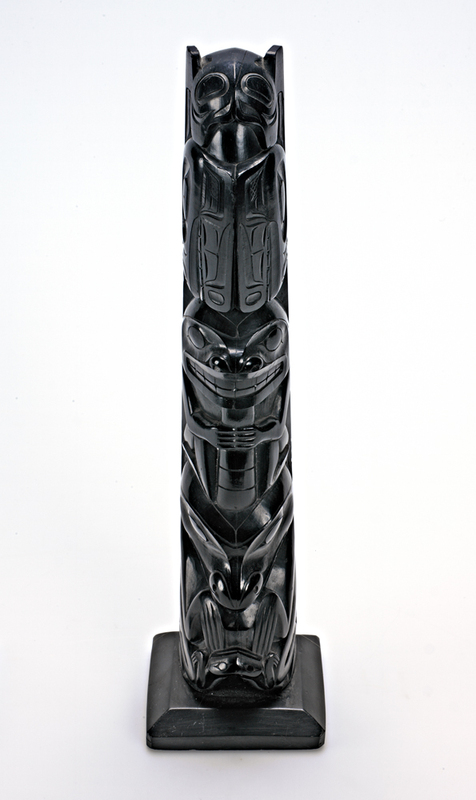 The vivid, expressive animal figures and calligraphic formlines found on argillite carvings such as this crest pole characterize the rich aesthetic language of the Haida, who call themselves Xay’de, meaning “The Good People.” The unique stylistic identity exemplified here pervades Haida culture, and can be found everywhere on Haida Gwaii, from large cedar house poles to tattoos. Embedded within the fluid lines, ovoid forms, and vibrant imagery of their artwork is a myriad of allusions to the Haida social fabric, geneology, environment, and mythology. In the case of crest poles, iconic animal forms, such as the killer whale on top of this object, denote a specific clan affiliation and mythological heritage. Upon their arrival on Haida Gwaii in the early 19th century, European traders were struck by the creative virtuosity of Haida artists, and encouraged carvers to begin producing works on argillite. Sadly, the arrival of foreigners also brought disease, and by 1915, only 588 Haida remained— approximately a tenth of their original population (Sheehan 2008, 18). Faced by the threat of cultural extinction, Haida carvers preserved their unique history, wildlife, homes, and inner beauty in argillite carvings, and sold them to European traders and collectors, “sending the message of being Haida to the world and to the future” (Sheehan 2008, 18).